Bahubali B. Kabnure and Rajkumar.D.PatilHeat pipe, Effectiveness of heat pipe, Inclination Angle, Mass flow rate. P.S.Badkar and D.M.KalaiDisc, brake assembly, wheel rotor, pad, caliper, alloy material, ANSYS, Solid Works, Boundary condition. P.Ramakrishnan and A.S.KrishnanCored brick, Porosity, turbulence inducer, pressure drop, temperature drop and heat transfer. Rajkumar.D.Patil, Dothre Dinesh, Hegade Sachin, Urane Vivek and Killedar VishalMilling fixture, mass production, CATIA, fixture plate, 3-2-1 principle. Vikas B. Magdum and Vinayak R. NaikRake angle, approaching angle, thrust force, feed force, dynamometer. Rajkumar D. Patil and Purushottam N. GoreGrey Relational Analysis; Modulus of rigidity; Torsion; Ultimate shear stress; Yield shear stress. P. MoheswariMHD, heat transfer, mass transfer, temperature field, velocity field, concentration field, skin friction. Harvinder SinghDisc brake, Coefficient of friction, frictional, Force, Tribological aspects, Wear rate etc. Hrishikesh Hinge, N. T. Dhokane and S. H. BarhatteInclination angles, nanoparticles, nanofluids, thermal resistance. Omkar Utture, Nikhil S. Mane, Shubham S. Varute and Asawari B. WaingadeRobotics, Animatronics, Electronics. M D Raj Kamal, P.Harish Krishna, G.Jagadeesh Babu, Ashwin Suresh and K.BaskarWind Turbines, Vertical axis wind turbines, Horizontal axis wind turbines, Renewable energy. Sudhir Mittal, Asha Rani and Rohit MehraHR-ICP-MS, Radiological effects, Physico-chemical analysis, Ground water. Vikas Gupta, Rajni Bala Ashok Kumar Garg3and Rajeev Kumar Ranjanheterogeneous objects, rapid prototyping, CAD modelling. A.Kaur and V.P.S.SranMetakaolin, M30 grade concrete, compressive strength and split tensile strength analysis. Kulwant Singh, Gurbhinder Singh and Harmeet SinghFriction stir welding, FSW process parameters, Microstructure, Magnesium alloys. Harnam Singh Farwaha, Sehijpal Singh Khangura and Gurpreet SinghMagnetic Abrasive Finishing, Non-Conventional machining Process, Percentage Improvement In Surface Finish. A.Karthick and L.PrakashDisk Braking System,Expremental Investgation. P.A.Naik and D.M. KalaiNASTRAN, TATRA chassis, PRO/E wildfire, Dynamic analysis, Static analysis. Harinder Singh Grewal, Avtar Singh and Jaiinder Preet SinghMagnetic Abrasive Finishing, Sintered Magnetic Abrasives, Surface Roughness, Lubricant, RSM. Jitesh Kumar Khatri and Jyoti KumarDesign Automation, Development cycle time. Ram Singar Yadav, Gyan Singh and Vinod YadavaElectro-Discharge Face Grinding (EDFG) process, Al/SiC MMC, Material Removal Rate (MRR) and SurfaceRoughness (Ra). Kapil Sharma, Satnam Singh, Manvendra Yadav, Sanjay Yadav and Naveen Mani TripathiSolar energy, solar thermal systems,nanofluids, solar thermometric cells, parabolic trough system, solar collector. Sonal V. Patil and Bhau K. KumbharMagneto rheological fluid, yield stress, shear mode,compression mode. Hiren V. MandaliaEthanol, Ethanol, Blend, Biofuel, Diesel engines. Kamble Shirkant Hari, Chougale Dayanand Shivaji and S. I. JabadePiezoelectric material, thermoelectric material, harvesting energy. 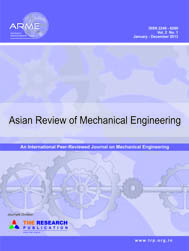 V.Balakumaran, C. Parthasarathy, and J.ChandradassCNC drilling, ANOVA, Taugchi method, CNC lathe, Surface roughness and MRR. R.S.Babu, C. Parthasarathy, and J.ChandradassGFRP, glass fiber, optimization, surface roughness and Taguchi’s technique. R Sundara Raman, G. Sankaranarayanan, N. Manoharan and S. SendilvelanSox, Nox, Particulate Matter, Diesel Engine, MARPOL Regulations. P. Venkateswara RaoPogamia methyl ester, POME, Biodiesel, Performance, Exhaust emissions. Mohammad Amin Rashidifar and Ali Amin RashidifarNon-linear signal analysis, Friction force identification, Wear, Vibration. Niraj N. Raja and Sheikh YasinDiesel engines; Biodiesel; Transesterification, Performance parameters. Bhupesh Walia, T.P Singh Sarao and J.S GrewalCorrosion, Thermal Spraying, HA+Al2O3-TiO2, Hank’s Solution. Iqbal Singh, Gagandeep Kaushal and Hazor Singh SidhuMagnetic abrasive machining, surface finish, abrasive particles, taguchi approach. Yadwinder Pal Sharma and Pardeep KumarFriction stir welding, aluminum alloys, mechanical properties, rotational speed, pin profile. Gagandeep Singh Dhaliwal and Pardeep KumarFriction stir processing, microstructure, microhardness, tool-pin profile, flood cooling. Manjit Singh, Amit Handa and Sandeep Singh SandhuCladding, Stellite 6, Wear, Mechanical and Metallurgical properties. Abhijit MukhopadhyayEPDM, plate on roller tribo-test rig, COF, Wear. Sachin. L.S, Mayur. S1, Pavan. K.M, Chandrashekar. A and B.S. AjaykumarAA-5083, Cryogenic Treatment, Arc Voltage, Welding current, TIG Welding. Sandeep Singh, Sanjeev Kumar, Harvant Singh and Lovedeep SinghAustenitic stainless steel; microhardness, microscopy. Rupinder SinghTIG welding, statistically controlled, sensitization, hardness, tensile strength. Chamkaur Jindal and Hazoor Singh SidhuShielded Metal arc Welding, Solid Particle Erosion, Microhardness, Stainless Steel, Molybdenum. T.S Bedi, S. S Aulakh2and G. KaushalHigh Temperature Corrosion, HVOF Thermal Spray, Boiler Steel. K. Sreekesh and P. GovindanWater jet Machining, Abrasive flow rate, Taguchi methodology, mechanism of removal, Surface finish and Optimization. Rupinder Singh and Munish K GuptaFused deposition modeling, Investment casting, Dimensional accuracy, Part orientation, No. of layers, Slurry layer’s combination, Metal type. Rajesh Kumar Porwal and Vinod YadavHole sinking electrical discharge micromachining, HS-EDMM, Optimization, GRA, grey relational analysis, PCA, principal component analysis. Amit Handa and Vikas ChawlaFriction Welding; Dissimilar Materials; Mechanical testing; SEM analysis. Manoj Kumar, Pawan Kumar Sapra and Balwinder Singh SidhuFriction Stir Welding, Aluminium alloys, Microstructure, Tensile strength, Vickers hardness.